Michael wakes up with amnesia, but he knows the agent in front of him is up to no good. Trusting his instincts, he flees. Getting away from the agent wasn’t too hard, but living without memories, identity, money, or a place to go prove much harder. The world he finds himself in is torn between those who can perceive emotions and those who are afraid of the Perceivers. Michael falls in with one of those groups of Perceivers and wants to help them as much as he wants to find out who he was. This book was full of action and scenes of chase and destruction. It was a fun read about a possible science fiction future where society is split between those who have a power and those who resent and fear those with that power. Of course people would turn to laws and legislation to bind those with telepathy and to erase whatever part of their minds houses the telepathy with no regard to their identity and opinions. It made me grind my teeth at times how insensitive those in power were for trying to suppress the use and future of telepathy, even when it was ingrained into the person’s identity like another sense. I did find it hard to believe that the teenagers would be able to oppose the government like they were able to in this book. They also seemed to be able to source whatever they needed in this opposition, such as access to a lab. 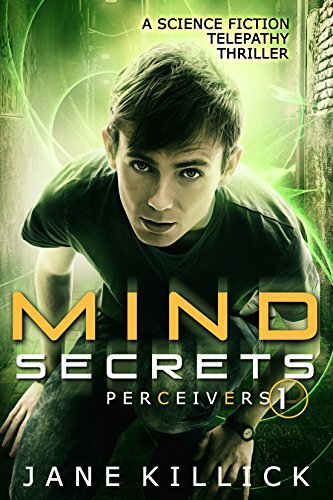 I really liked the angle this book took on ‘mind control’ as it was a very soft version of telepathy, like the beginning stages of the evolution of mind control. This novel was published by Amazon Digital Services LLC 01/11/16 and is available on Amazon here.